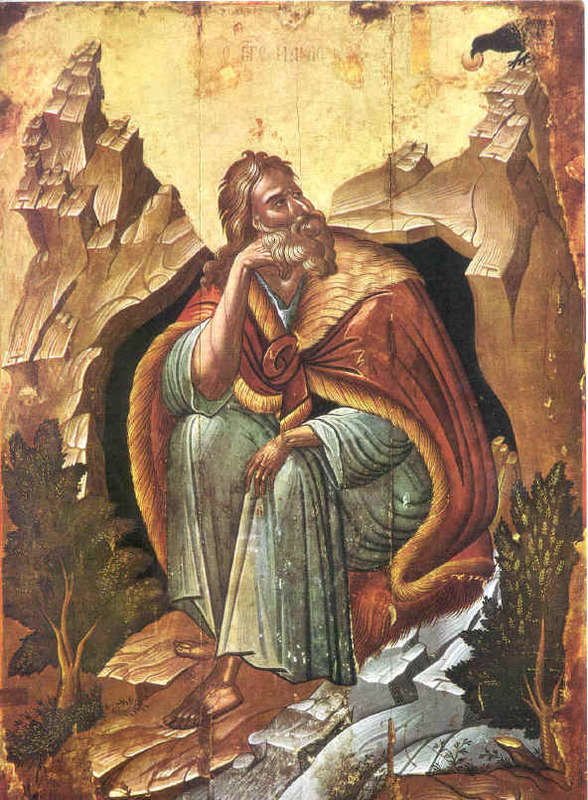 Feast of the Prophet Elias (Elijah) the Thishbite. Today we remember Elijah, Profitas Elias, after whom a number of mountains are named. When the Church moved into the mountainous areas of the Mediterranean, the memory of worshipping the pagan gods on high hills would have had to be overcome, and the reason for that worship would have been ancient volcanoes – very old memories of fire, and events like lightning burning up the mountain. 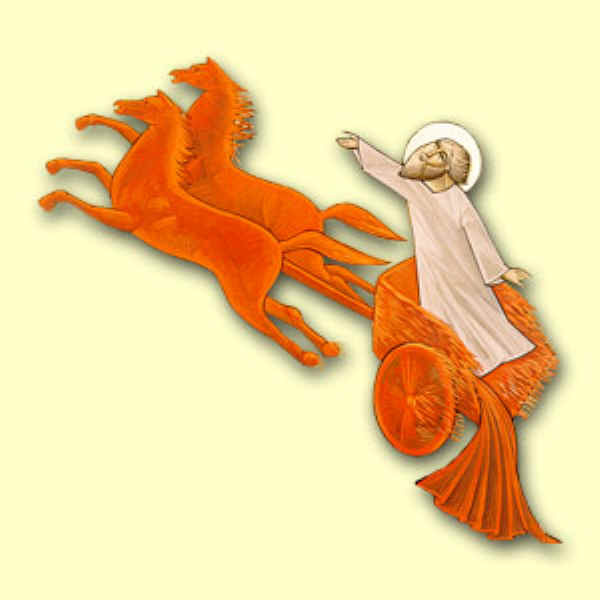 We are told that Elijah at his death was taken up in a fiery chariot (II Kings, 2). Elias lived in the wilderness, a kind of monk (I Kings, 17: 1-6). On Mount Carmel, Elias had prayed against the priests of Baal for the God of Israel to be vindicated (I Kings 18); and fire fell from heaven, igniting the sacrifice of a bull, when Elias prayed for God’s will to be done. Again on Carmel, Elias had prayed for rain; and the drought was broken through Elias’s prayer. Then on Mount Horeb (ch 19), Elias took refuge from the persecution of Queen Jezebel, who wanted to kill him because he had killed the prophets of Baal. At that time, Elias was the only prophet of God left in the land; and so on Horeb he put himself in front of God; and firstly, wind passed by and tore at the mountain; then an earthquake; then a fire; then a sound of a gentle breeze – and it was in that sound that God spoke to Elias. But the small, quiet voice of God motivated Elias to defy the evil of King Ahab. When Ahab’s greed for a small farmer’s vineyard led to his death being engineered by Jezebel (ch 21), Elias condemned Ahab and his family. The picture of Elias praying in isolation and meeting God in virtual silence is an image of prayer at all times. Elias also performed miracles of healing (I Kings: 17). The first Christians preached with the same strong faith that Elias had shown; and as Elisha, the disciple of Elias, prayed his teacher to give him a double share of his spirit (II Kings, 2), so the new teachers prayed for the Holy Spirit to descend upon them with the gifts of wisdom and power which would change the hearts of people. Elias is the typical Old Testament prophet: an obedient servant of God. Jesus appears in that tradition and makes people think of that example. The epistle of James reminds us of the endurance of the prophets, who spoke in the name of the Lord. We call them blessed because of their endurance. ‘You have heard of the patience of Job, and understood the Lord’s purpose, realising that the Lord is kind and compassionate.’ (James 5: 11) Suffering can be a source of spiritual wealth; we can be truly fortunate because we have been in an obvious sense most unfortunate. The epistle goes on to say that ‘above all’ – meaning above all other signs of impatience - do not exaggerate by making professions of intention – e.g., ‘By God I shall do so and so’ – but just do it, making your words simply Yes or No. The confession of our faults – admitting that we have made a mistake – to the person whom we have wronged should be normal for Christians; but so also should it be for us to admit our sins to another Christian to seek his intercession and by that the healing of our soul. In Jesus’ day, believing Jews did this to their teachers (rabbis), and James advises us to do this to our teachers (our priests). James then reminds us of Elias. ‘Elijah was a human being like ourselves’, but his prayers against rain worked (I Kings: 17, 1; 18, 1) and when he prayed for rain, that prayer was answered also. (Ch. 18) The double share of the spirit of the great prophet Elias is now exceeded by the pouring into our hearts of the Holy Spirit, so that our prayer may be more effective than the prophetic prayer of Elias. Our confession of sins may lead to our healing, just as being anointed can bring us into the mystery of Jesus’ preparation for his death and then his resurrection – which is ours also. The Anointing Service in church in Great Week, or in a hospital, has the same purpose: to pray for us to be returned to health, and that may be a health known to God and not available through medicine. It may be health beyond death but reached only by death. The main point is to pray in faith and to accept with the endurance of faith: faith greater than Elias’ faith, endurance greater than Job’s patience. James ends with most characteristic advice. ‘… if one of you strays away from the truth, and another brings him back, he may be sure that anyone who can bring back a sinner… will be saving a soul from death and covering up a great number of sins.’ This refers both to the sins of the returning sinner and the one who helps him to return. We can be blessed if we enter the misfortunes of those whom we seek to save. The gospel reading is also about healing. Jesus visits a village, Gadara, where pigs are kept; thus, not a Jewish community, but one of the Greek towns. Two men possessed by demons come out of tombs. The evil spirits controlling them make them ‘so fierce that no one could pass that way’. The men are all the more repugnant because tombs are regarded as unclean places. Now they recognize Jesus as Son of God; and their words ‘What do you want with us…. Have you come here to torture us before the time?’ show that they recognize the power of the Son. ‘Before the time’ means that the demon-possessed men understand that the end of the world will be accomplished with the power of evil being ended. Jesus is silent, so that the shouting of the two men must have expressed their fear and uncertainty. But the devils plead with Jesus to send them into the herd of pigs feeding ‘some distance away’. The demons realize that Jesus can compel them to do what God wants and they know that they can be expelled from the two suffering men. ‘Go, then’, says the Lord. It is the short, direct way with evil. It has to be rejected. The clash between good and evil is always disturbing. The pigs stampede into the lake and the townspeople ask Jesus to leave. Firstly, there is the reason of the economic loss; the livestock have all drowned. Secondly, there is the disturbing character of Jesus himself. Even if the two men, who had formerly been demon-possessed, were now free from pain and no longer dangerous to the community, the community could not recognize their restoration to health as more important than the loss of livelihood and meat supply. They would have to come to terms with the fact of healing and its costs after they had considered things. But they would find it difficult to accept someone as personally powerful as Jesus. ‘He got back in the boat, crossed the water and came to his own town.’ This town must be Capernaum (Cf. Matt. 4:12). Jesus does not attempt to dominate the townspeople or object to their reactions. He has done what is right. He leaves because they do not want him to stay. And he is about to continue other healing work. The little voice in the quiet, which Elias heard, told him what he must do to bring faith back to Israel. Jesus by his silence told the demons that their time had come. Here are two examples of God making us think; and if we are ready to act, we too can say ‘Go, then’, and make evil flee. But we need the faith of Elias, the endurance of Job, and that double share of the spirit of Elias, which is the blessing of the Holy Spirit. In the end it is the voice of God – not the fiery chariot – which makes Elias a prophet. In our life, it is not possible to be Christians unless we listen. © Dr. M. R. Brett-Crowther. July 20th 2003.